The Wild Coast Expedition covers 330km of unspoilt coastal wilderness over 12 days. 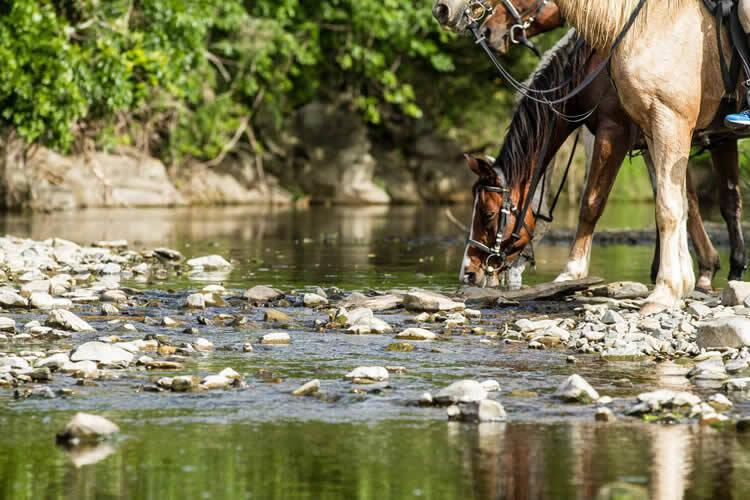 Nowhere else will you experience this level of adventure on horseback; swimming of deep rivers, endless beach canters, and the rugged natural beauty of a sub tropical paradise that will both enchant and challenge. After transfer from King Shaka International Airport, Durban, you arrive at the Old Pont in Port Edward on the banks of the uMtamvuna river: the border between KwaZulu-Natal and the Wild Coast. 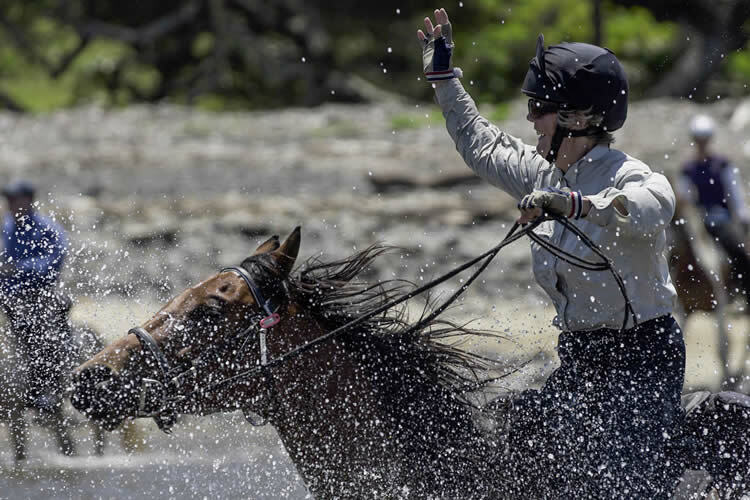 You will have time to freshen up before meeting your horse, the sole means of your transport for the next 10 days and 330 kilometres. We will also test your riding gear to prepare for the days ahead. In the evening over dinner your guides, Barry and Joe, will provide a briefing on the adventures that await. An early start is required on our first day’s riding. 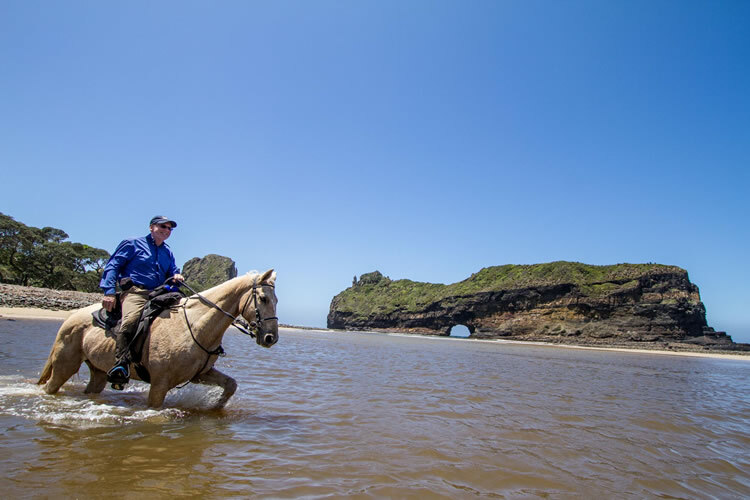 We cross the uMtamvuna river on the beach, entering the Wild Coast and setting out at a brisk pace, trotting and cantering some 20 kilometres of pristine beaches, to reach the major obstacle of the day, the mighty uMtentu river, before high tide. The uMtentu will be your first of many swims during the next 10 days riding and it is one of the major swims of the whole journey. After crossing the uMtentu, we get to rest and congratulate our horses and ourselves. After taking our lunch on the banks of the river we enter the grassy rolling hills of the Mkhambathi Nature Reserve and there is opportunity for some sightings of game before we reach our destination: Msikaba, situated just beyond the reserve. The gentle hills of the Mkhambathi Nature Reserve end in a shelf of rock that drops into the Indian Ocean, the soft turf underfoot makes for good going, while to our left the ocean waves explode in white plumes against the rock shelf. As the coastline becomes more dramatic we ride inland and into more remote upland country. We cross the famous Waterfall Bluff and stop briefly to look at one of the few rivers in the world where fresh water drops directly into the ocean. Our day ends with a steep descent to the beaches of Mbotyi and a final canter before we reach the comforts of a hot shower and perhaps some oysters, caught that day off the rocky shore, before dinner. The coastline today is dramatic. We climb hills with precipitous drops into the Indian Ocean that provide ample opportunity for whale watching. 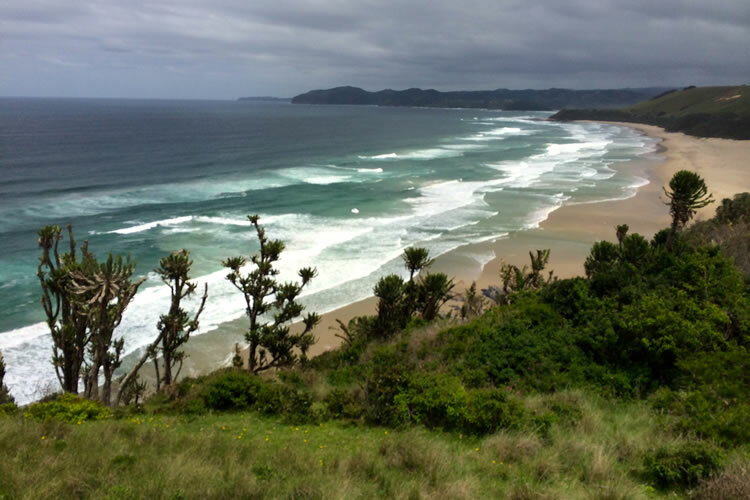 A major escarpment inland makes this section of the Wild Coast one of the most inaccessible and remote. The massive hills and forested valleys are punctuated with prisine beaches and azure estuaries. We time our ride to cross the uMzintlava river at low tide, hoping that rains have not swelled the waters, and we lunch on the banks of the beautiful uMntafufu estuary. Our day ends at The Pont in Port St Johns, on the banks of the uMzimvubu river where the crew will light a campfire and cook while you enjoy the sounds of the river and the brightness of the stars in the Wild Coast night. From Port St Johns we head into the forested hills and the Silaka Nature Reserve before we drop down to the coast again and the beautiful beaches of uMngazi. We will cross three significant rivers today, with one, the uMngazana, being a swim. After getting ourselves wet we wend our way inland again amongst the forested hills and valleys before our day ends at The Kraal Backpackers, where your bag will be ready and waiting. After freshening up we may have time for a beer in the local village, or simply enjoy the special ambience of The Kraal and its beautiful setting, before enjoying a dinner prepared by the women of the Mpande village. 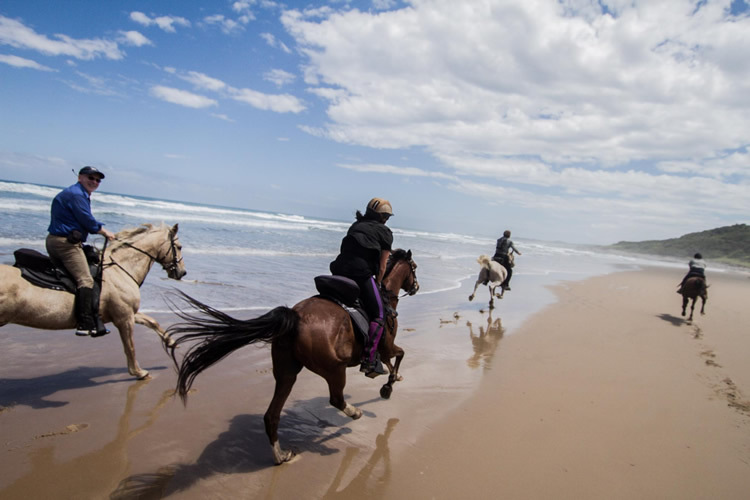 A short canter down the coast brings us to the very special luxury of the Hluleka Nature Reserve, giving your horses a chance to rest while your guides get the fires burning and provide you with a braai – or South African barbecue – quite possibly the culinary highlight of your stay. We cross some challenging countryside as the coastline steepens and the hills and valleys grow in stature. Our route will alternate between these big hills, deep wooded valleys and the occasional estuarine beach: dramatic terrain of breathtaking beauty that will test your resolve and stamina. We cross one major river, the uMtakatye, which usually presents a challenge! Our day ends at the beautiful uMdumbi River Mouth and Mdumbi Backpackers. We should have time for a beer at the local shebeen (or watering hole) before you prepare for dinner, no doubt thankful for a soft bed and an early night! A big day! Departure on this day will be timed to the tide, to make for easier swimming of the nearby uMtata River, a challenging prospect and not to be taken lightly! Once this obstacle is overcome, we still have a lot to achieve. We pass Coffee Bay and the famous Hole-in-the-Wall, where the Mpako River meets the ocean and thereafter our route takes us onto the high ground above the coastal cliffs for more dramatic scenery and some exciting climbs and descents to sandy bays, before a final blast down the beach to our destination and resting place of Bulungula Lodge. We depart after a leisurely breakfast. The coast begins to settle into gentle hills that roll into the sea with fringes of dune forest and gorgeous beaches. 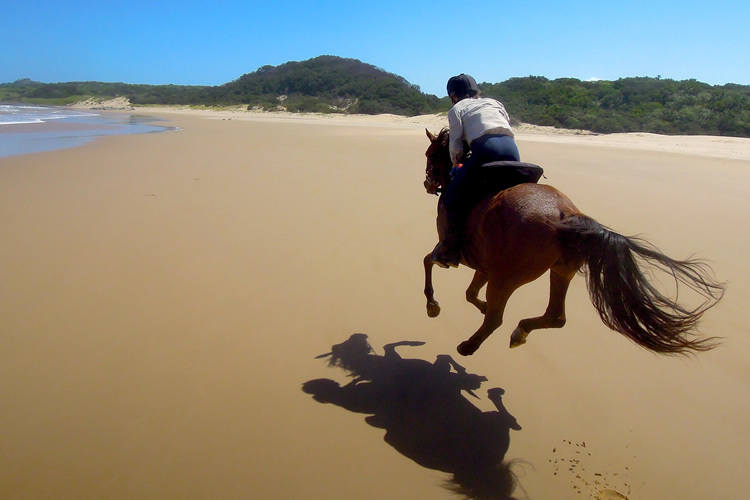 The Xora River is likely to be a swim, but otherwise the day’s riding alternates between the grassy sides of these rolling hills and magnificent beaches that present the opportunity for carefree gallops that often prove too much for either mount or rider to resist! The last stretch of the day leads into the Dwesa Nature Reserve and through magnificent coastal forest before we reach The Haven and its creature comforts. Departure will be timed with the tide to make the crossing of the Mbashe River possible. Once we’ve conquered this major obstacle, now feeling invincible, a long day of riding lies ahead, with another swim at the Nqabara River. 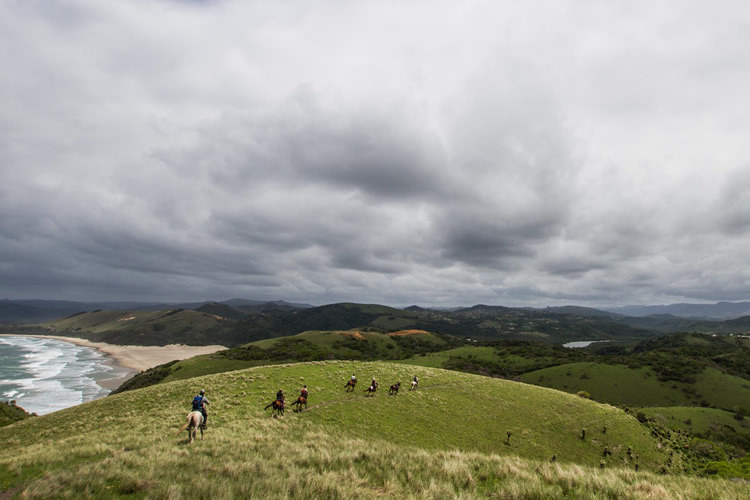 Riding is once more a mixture of pristine beaches and remote coastal hills; the beauty of the Wild Coast will by this stage be leaving a deep and lasting impression on you. The day ends at Kob Inn where your travel bag and the comfort of a cold drink and a hot shower await. Our last day of riding starts with the crossing of the Qora River, after which it is another blissful day in the saddle of ridiculous Wild Coast beaches and rolling hills, including one the finest stretches of hard sand on the Wild Coast and a seemingly endless gallop to the mouth of the Inxaxo River. We wind our way along sandy tracks through the coastal scrub, moving in and out of the trot and canter with the rhythm of the terrain. We pass the famous wreck of the Jacaranda before the crossing of the Kei river marks the end of the Wild Coast. We cross the Kei with the horses on the ferry and find ourselves in the hamlet of Kei Mouth. After settling in and washing the dust of the trail from our tired bodies, we gather to enjoy a farewell dinner on our last night together. We will gather for breakfast, after which you will depart as arranged. Cloudjuice. 2016. All Rights Reserved.